We represent San Jamar an international supplier of food safety tools as well as smart disposable dispensers in food service and washroom environments. Sanitary washrooms environment starts with clean, contemporary dispensing solutions. 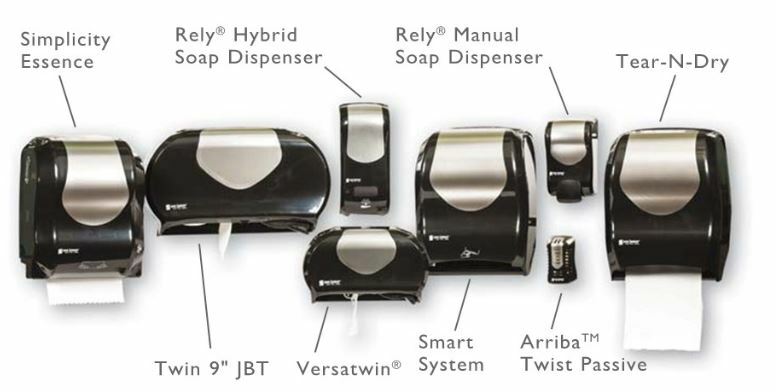 San Jamar offers innovative ways to provide worry-free dispensing crafted with high quality materials that improve hygiene, cut cost and enhance overall image. Engineered for ease of use and minimal maintenance. Touchless towel dispenser offer the best option for sanitary hygiene. Dispensing all types of 8″ roll towel paper up to 800″- any brand or quality. Designed to dispense any brand of quality of C-Fold or Multifold towels one-at-a-time, reducing waste. Dispenser saves room on your counter top and ideal where space is limited. Dispensers mount directly into he counter to save valuable counter space. Provides a one-at-a-time dispensing to reduce napkin waste by 30%. This dispenser offers a professional looking solution for dispensing both standard or industrial bath tissue. This dispenser offers industry leading high capacity dispensing for 9-12″ rolls of tissues. Summit Family of Dispensers – Is Growing! The Summit Series is available in the dispensing options above. The looks it comes in are Black/Stainless, Stainless, White or Custom.